seePyou wrote: "The memory transfer speed itself is not that slow, but the waiting (latency) time between ordering and receiving it is. " CAS refers to reads withing the same row in the DRAM bank (data local to the previous read). Once you switch rows you need to take into account the row switch itself. In random unpredictable accesses this will start dominating. Because memory modules have multiple internal banks, and data can be output from one during access latency for another, the output pins can be kept 100% busy regardless of the CAS latency through pipelining; the maximum attainable bandwidth is determined solely by the clock speed. Unfortunately, this maximum bandwidth can only be attained if the address of the data to be read is known long enough in advance; if the address of the data being accessed is not predictable, pipeline stalls can occur, resulting in a loss of bandwidth. For a completely unknown memory access (AKA Random access), the relevant latency is the time to close any open row, plus the time to open the desired row, followed by the CAS latency to read data from it. Due to spatial locality, however, it is common to access several words in the same row. In this case, the CAS latency alone determines the elapsed time. Why did RAM Module latencies raise so much over the years? It's not that they raised, the timings on the table in the wikipedia article indicates that the absolute times have stagnated. It's more that the clock speeds have increased which means that the cas latency which is relative to the clock speed has increased. But the higher clock means that more memory commands can be sent and have more operations in flight instead of just the single operation. According to the wikipedia entry, the best memory would be the DDR3-2200, which has the best first, fourth AND eighth word timing of all memory types. Is that a correct way to look at it? What is important here, in this forum, what memory should I have for playing Factorio with the most UPS? Just as I try to logistics/combinator my way through the chest issue, help is on the horizon. -I have 1 requester chest per item type to buffer, requesting a small amount of, say, laser turrets, but more than 1. Eg. 10 requested. This will be filled over time, and does not drain my 1-2k laser turret stash. -Then I have a inserter put 1 of them into a long term storage chest, if if none of that type are in there. (Stack size of inserter limited to one, using a short red wire to tell the inserter if the chest has zero lasers). This does work sometimes. Apperently the bots have a bad memory and sometimes will make some long range storage deliveries before using the close option. But, in general, if I don't rely on it totally, and account for some mistakes, and don't make any big orders before being sure the bots know about the close chests, it greatly reduces my delivery time. I mark the buffers by including a turret and placing them obvious in the power grid, so I can remove the unused ones or fill in gaps easily. The one with the smallest latency. In my method? No, no looping to speak of. As soon as there are 11 items, the carrying stops (which is really quick in my experience). I think this is because while the item is transferred by the inserter, a replacement is choosen from somewhere else before the inserter places it in the chest. Try for yourself. Edit: Coming to think of it, you are totally right and it really should loop, but for some weird glitch it doesn't for me. I thought the buffer chest was supposed to allow "Buffer -> Requester." I've found that it does not let items get pulled from the buffer chests. 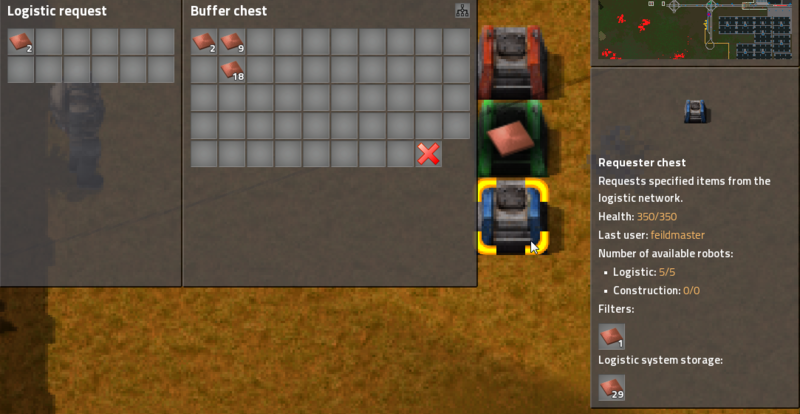 feildmaster wrote: I thought the buffer chest was supposed to allow "Buffer -> Requester." I've found that it does not let items get pulled from the buffer chests. I was about to say that's not how it's supposed to work, so it's probably a bug, and then I found the bug thread where the devs say they intentionally changed the behavior. EDIT: According to this post, which links to a Reddit post, this change is not necessarily permanent. Whew. Hmm, you may want to mention the bit about counting towards the logistic network on a new bug thread. Not sure how much the "not a bug" threads are really monitored once the devs classify them this way. Perhaps you've found a complication with making that change that the devs didn't consider, and hopefully they won't just remove the counting. Personally, I hope something like this sways the devs back to implementing buffers as the FFF outlined. Either way, you may also want to discuss further on the new suggestion thread on this. Last edited by _alphaBeta_ on Thu Dec 14, 2017 7:52 pm, edited 1 time in total. I'll move discussion there now. Request items that are made on a limited basis *and* still count them while in the chest. For example: I have it so I make up to 500 spare empty barrels. When barrels get emptied they count to the network, as per usual, however when I request barrels I put them in a buffer chest at 100 at a time, before I'd have 100 barrels sitting there not counting to the existing amount. Now they count towards the limit.